I’ve been thinking about lost time lately. The time I’ve spent trying to beat Randy’s score at computer mahjong. The time I’ve spent watching television. Time I’ve spent staring at my workshop, trying start a new project, but being distracted. Where does all that “lost time” go? Does it vanish like a melted icycle, or is there a place where it gathers, tucked into nooks and crannies? A place that you might find someday and say “wow, here’s that fifteen minutes I spent looking for the sunglasses that were on my head” or “amazing, I always wondered what happened to that lost hour when I couldn’t find parking and arrived at the gate just after the plane had left.” Maybe it’s not really lost, it’s just transformed into another kind of time. The time you spend thinking can be as important as the time you spend doing; but most people are only going to see the results, not the thoughtful effort that made those results possible. Since I’m working on deadlines, in my real life and in my art life, I’m always aware of time. This waterglobe reflects some of the ways I view time: small time, big time, fast time, slow time, and random time. With a two-sided, slightly crooked grandfather clock, miniature Big Bens, watch parts and clock faces and hands, I lost count of the clock pieces inside the waterglobe. As an added bonus, the sparkles and confetti in the liquid include metallic silver numbers which swirl about when shaken. You can see a number seven settling in this photo. I like to think of them as the lost minutes I almost could reach out and take back. Here are four sides of the waterglobe: Lost_Time. 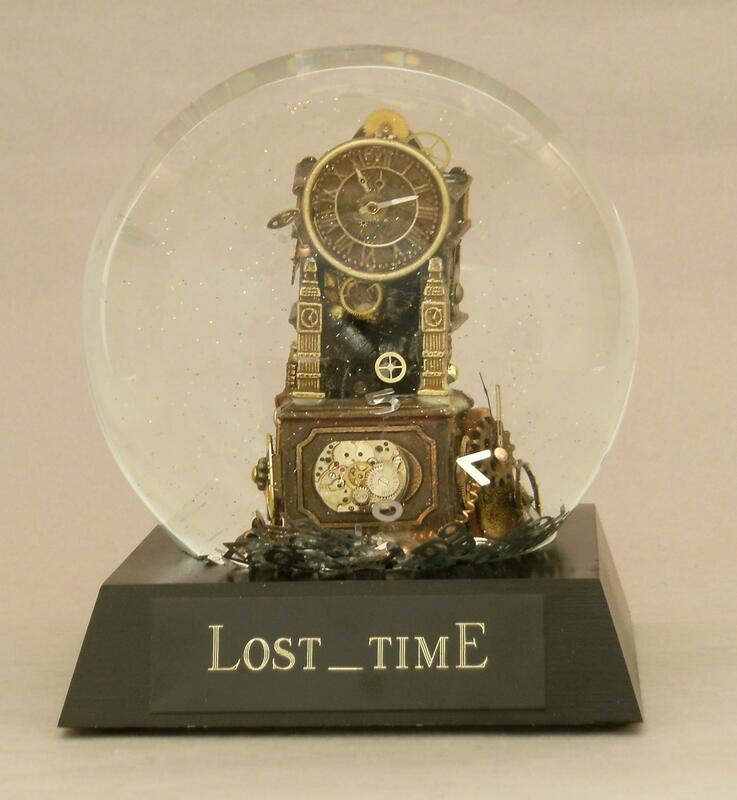 This entry was tagged clock globe, steampunk snowglobe, waterglobe. Bookmark the permalink. The globe is amazing! How fun! I want one!